Imagine being able to turn your favorite pizza flavor into the best pasta salad you’ve ever had! That’s exactly what this Hawaiian Pizza Pasta Salad is! 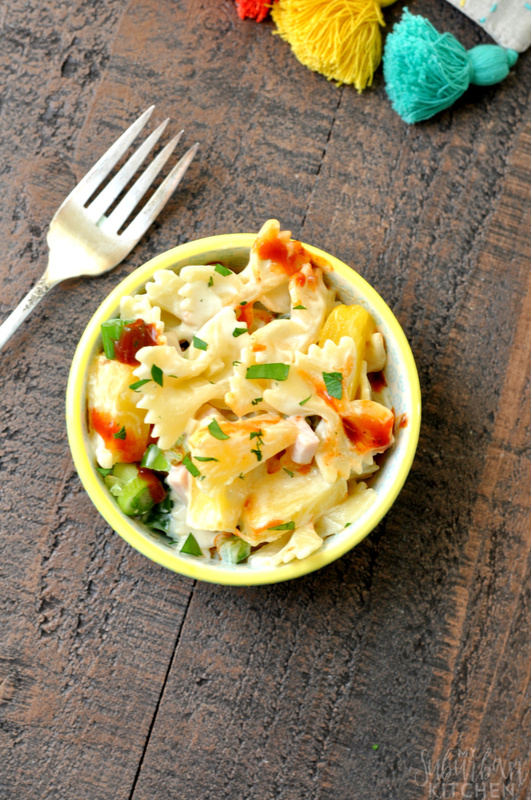 This pasta salad recipe has it all, from sweet pineapple, green peppers, tangy bbq sauce, to Canadian bacon! 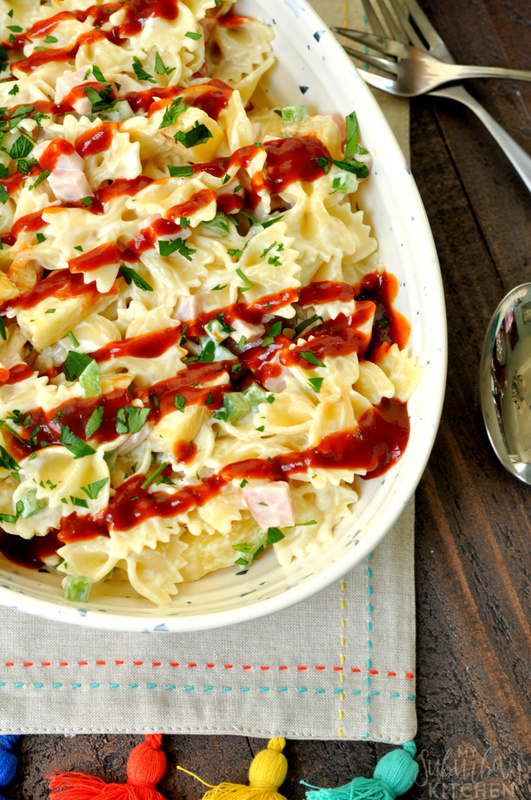 Everyone will love this Hawaiian Pizza Pasta Salad recipe! Mathlete loves Hawaiian pizza. There is something about the combination of pineapple and ham that he can’t resist. Since it is summer, we end up a lot of picnics and BBQs and not very many pizza parties. So, I decided to turn his favorite pizza into a pasta salad. 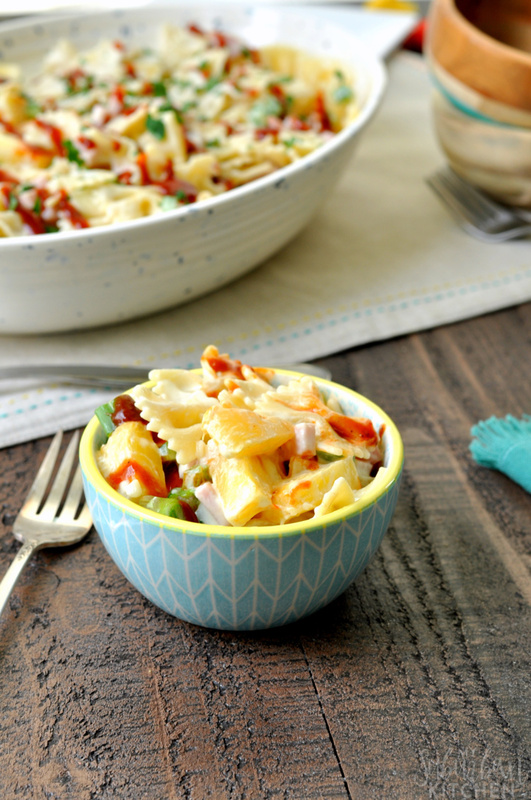 This Hawaiian pizza pasta salad is always a favorite at our house and is sure to be one in yours too! This Hawaiian pizza pasta salad is definitely different than a traditional Hawaiian pasta salad. I am throwing that out there from the start so there is no confusion. They are both super delicious though so I encourage you to try out a traditional Hawaiian pasta salad at some point too. 1. Cook pasta according to package directions. Drain and rinse with cold water. 2. In a small bowl, whisk together mayonnaise, Greek yogurt, sour cream, mustard, juice and vinegar. Season with salt and pepper to taste. 3. In a large bowl, combine pasta, pineapple, green pepper, Canadian bacon, and dressing. Stir to combine. Refrigerate until chilled. Before serving, drizzle with barbecue sauce and top with green onions. For mine, I always use orange juice because I feel like the pineapple juice makes it a little too sweet. Try both and see which one you prefer. What are your favorite pasta salads for summer? Do you have a favorite pizza that you order over and over again like my husband does with his Hawaiian pizzas? In a small bowl, whisk together mayonnaise, Greek yogurt, sour cream, mustard, juice and vinegar. Season with salt and pepper to taste. In a large bowl, combine pasta, pineapple, green pepper, Canadian bacon, and dressing. Stir to combine. Refrigerate until chilled. Before serving, drizzle with barbecue sauce and top with green onions. I would love to try this out because we have some hawaiian loving people in the house!